The number of internet users in rural China reached 209 million in 2017, with a penetration of 35 percent. Tech giants and start-ups are capitalizing on this to develop education access in remote areas of the country. How technology is empowering rural China in different industries was a common topic at East Tech West this week. In a nation of nearly 1.4 billion, ensuring there’s efficient health care and education is a tall order for China. Especially in some of the more remoter parts of the country. At the East Tech West conference in Nansha, Guangzhou, this week, business leaders, investors and experts contemplated how the country can effectively “equalize” these services for the whole nation. Indeed, the number of internet users in rural China stood at 209 million in 2017, around 30 percent of the total online population. This represents a good starting point for the tech industry, with established giants and start-ups trying to capitalize on key areas like education, health care and food production. Technology is being developed to give students in rural China more access to education via online learning platforms. This is because of a teacher shortage in remote and impoverished areas, according to a report by venture fund 500Startups, released in July this year. Chinese unicorn, VIPKid, launched the Rural Education Project in 2017, which aims to bring online education to 10,000 classrooms by live-streaming lessons. “The limit is, as a platform, how we can maintain the highest quality possible where we are undergoing this rapid growth (and) how we can stay focused on quality and learning efficacy when we are learning with so many teachers,” VIPKid CEO and co-founder Cindy Mi told CNBC Tuesday at East Tech West. This tech push in education comes after China’s Education Ministry required governments at all levels to spend a minimum of 8 percent on digitalization of education, according to the report by 500Startups. It also noted that 55 million students in rural schools in China are now reachable by live-streaming classes. Artificial intelligence (AI) is a major buzz word at any tech event these days, but at East Tech West there was a focus on how it could solve problems in industries like health care. Jim Wang, the CEO of health care conglomerate NovaVision Group, believes AI will level out the quality of care in the coming decades. He said it will likely close the gap between rural and urban parts of China. “Over the last 30 to 40 years, not enough medical resources have been deployed (equally) … There’s a lot of mistreatment. Medical A.I. will smooth that over. For example, we can train A.I. to support the rural countryside medical doctors,” he told CNBC. He also talked about screening for diseases from just one picture of an eye. ”In China, we don’t have family doctors and a referral system. Everyone will go to the big hospitals, which is why big hospitals are very cramped,” he explained. Thus he hoped A.I. would reduce the need for people to go to larger, urban hospitals. Catrinel Hagivreta, the founder and CEO at MEDIjobs, an A.I.-based recruitment start-up for the health care industry, explained to CNBC why China needs a radical solution like A.I. : “Studies have shown that aging population is a huge problem for China, with one-in-three people being 60 years or older by 2050. On the other hand, in 2016 the Chinese government raised the limit on the number of births per family from one to two, which means more births and a population growth boom,” she said via email. “For the medical industry, those two factors indicate: a growing number of retiring health care specialists and a growing need for health care services … That requires a radical solution like A.I. for health care, which can better allocate resources to patients. Especially in the rural areas, technology like telemedicine is one of the few ways issues like this can be solved,” she said. Meanwhile, Dan Wang, a technology analyst at macro research firm Gavekal Dragonomics, told CNBC via email he thinks A.I. can make an impact, but believes there’s room for improvement. “AI has the potential to significantly improve health-care technologies, especially in medical image processing. On the margin, however, I suspect that low-tech solutions are more important for transforming health care in China. There’s still lots of room left to improve the basics of patient care and health administration,” he said. Further plans for China to incorporate A.I. in industry doesn’t stop at health care. Edith Yeung, the head of 500 Startups in China, and the creator of The Chinese Internet Report, talked to CNBC about how it can also help farmers. “Chinese food safety is a big issue, so you see, you know, Tencent and Alibaba both partner up with farmers to actually build the so-called A.I. pig, and chicken, to literally use IOT (the internet of things) devices to keep track of the vital signs, on pigs that we will eat, and make sure that food is safe. So, there are so many fun examples,” she told CNBC. Alin Iftemi, the chief technology officer at Modex, in charge of blockchain and A.I. research and development, told CNBC that the Alibaba use case is an interesting one. But he added that the are many other better examples of how A.I. and the blockchain can help farming. “Alibaba is focused on animal protection because the algorithm can predict eventual disease for the animals. But A.I. can drastically improve the agriculture costs in poor rural China in more ways,” he told CNBC via email. “For example, image processing A.I. algorithms can help drones determine affected harvests, low or high humidity areas and automatically trigger on the spot repair actions from devices like drones. Instead of wasting pesticides or water for an entire field, A.I. helps farmers use only how much is required, where it’s required,” he added. Despite the clear optimism and enthusiasm from business leaders, some analysts will still point out that changing rural China is a complex issue that won’t happen overnight. 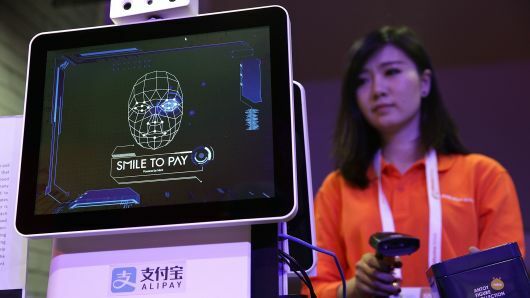 David Tyfield, an expert in Chinese innovation at the U.K.’s Lancaster University, told CNBC that education technology is increasingly big business and there is no reason to doubt that it could be very effective. However, it doesn’t come without challenges, he explained. “There are obvious — and possibly superficial — technological challenges, in terms of access to the internet or even electricity,” he said. “But while many of these may be fast diminishing, we need to be careful not to underestimate how significant they still remain, especially in a country of the geographic and demographic size of China,” he added.